Earlier this year when Ubisoft announced they would be making two games this year, many fans were worried that they were going for quantity over quality. Though after seeing Assassins Creed: Unity premier at E3 2014, all of those fears have not only been cast aside, but also set ablaze by the fires of revolution. Assassins Creed: Unity takes players in the French Revolution, one of the bloodiest and most chaotic periods in human history. Much like how the French Revolution paved the way for a new modern era, Assassins Creed: Unity is a complete game changer that doesn’t just add onto the existing format; but actually reinvents it from the ground up for the Next-Gen Consoles. So sit back and relax because I’ve gathered everything you need to know about this upcoming masterpiece into one E3 mega article. “Because of these new-gen consoles, this is the first time that we can fundamentally change a lot of the core mechanics and a lot of the stuff under the hood in terms of engine, game mechanics and actual game structure … So this is what Unity is. It’s not a reboot. It is a reinvention of Assassin’s Creed for this next generation.” – Creative Director Alex Amancio. From the majestic heights of Notre Dame to the creepy and morbid catacombs that lie beneath the city streets, the world of Assassins Creed: Unity is unlike anything you’ve seen before. Imagine the grandeur and scale that was sailing the Caribbean in Assassins Creed IV: Black Flag and apply that to the massive city of Paris. Architecture has been rendered in a pure 1:1 scale. In other words, if you’re afraid of heights, you might not want to look down while standing atop Notre Dame because you’ll truly feel the height. Haystacks? Where we’re going, we don’t need haystacks! In fact everything in this game has been designed for a true to life feel experience. 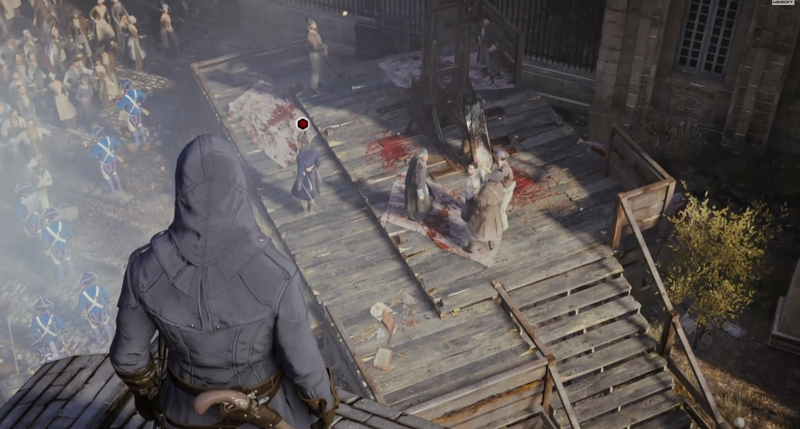 Whereas other games usually have 100-200 NPCs on screen at a time, there are times within Assassins Creed: Unity where you’ll experience massive crowds of close to 5,000 NPCs. Each acting on their own and yet in unity, these hordes truly give you a sense of mob mentality; and with countless factions at odds with each other during this tumultuous time, you’ll have to keep an eye out for anything and everything that might come your way. Even the building interiors have been redone. Whether simple abodes or multileveled townhouses and taverns, buildings can be interacted with like never before. Although it’s not just the city and world that has been redone, but also the way our hero interacts with it. A staple of Assassins Creed games has always been the ‘Leap of Faith’ into the iconic haystack. After a while this became repetitive – and a little bit of a joke considering physics and haystacks seemingly being everywhere. This eventually changed slightly into piles of leaves and ferns in Assassins Creed III and Assassins Creed IV: Black Flag, but it’s hard to imagine how this mechanic could work in the modern era. I wonder if that crowd of people will break my fall. No? Oh well, guess I’ll try something new and awesome. Assassins Creed: Unity finally begins to shift away from the ‘Leap of Faith’ and come to the new game mechanic of ‘Parkour Down’. ‘Parkour Down’ allows the player to have a much more controlled and planned path back to ground level. The transitions are seamless and the fluidity in which you move can only be fully appreciated by witnessing it in action. Additionally, a new ‘High Ground’ feature has been added that allows the player to quickly and seamlessly see any surrounding points of interest while he/she maintains an elevated position. There even seems to be moments when an Assassin can use his momentum to run horizontally along a wall for short spurts. This game might not be as large as scale as the Caribbean Sea, but it truly makes the entire city of Paris a playground the likes of which you have never experienced before. The world and how you interact with it isn’t the only thing that has been revamped. Skills, stealth, and combat have all been massively upgraded and redone. Over time we saw the ability of Eagle Vision evolve and become Eagle Sense. From discerning friend from foe to tailing objectives and discerning patrol patterns, this skill has become more and more refined to help the Assassins in their quest. This time around, it evolves once again into something called Eagle Pulse, which allows you to see without seeing. In other words, it can reveal what’s waiting for you inside a building so you can better plan your method of approach. Though initially a limited skill, this power can be strengthened over time to become even more powerful. In addition to Eagle Pulse, there is now something called Stealth Stance, which can be activated at the press of a button and help you effortless circumnavigate enemies via a cover-to-cover approach. After all, Assassins Creed is a franchise based on working from the shadows, rather than cutting your way through enemies God of War-style. Though when backed into a corner, you might need to cut loose; and your new and improved battle skills are more than enough to get you out of a tight jam. The Phantom Blade is the new signature weapon of this Assassin. Sleek, silent, and swift. This miniaturized wrist mounted crossbow would make even Daryl Dixon proud. Beyond this there are countless ways to approach and dispatch your target. From stun balls to incapacitate guards to the new disguise skill, which can allow you to walk right up to your prey, an Assassin’s skills have never been so sharp. Even the combat mechanics itself have changed. Repeated button mashing won’t work with large groups of enemies and you’ve have to reply on carefully planed combinations of parry, dodge, tackle and heavy attack will all become very important once you discover the improved AI of opponents and the perils of this living city. This time around enemies are not only smarter, but also more powerful. From brutal takedowns to vicious guard breaks, these opponents display tactics you’d expect Edward or Connor Kenway to demonstrate. Though it’s not just an individual well-trained enemy, but the city and your opponents as a whole. Paris is literally a living city. You wont just find little markers for missions, you’ll find your side quests through your interactions with the city itself. From a lady getting mugged to bystanders peering into a broken window, everything has the possibility of deepening your connection with this city. You will truly become immersed within the time and learn what factions to trust, which to avoid, and most importantly how to proceed. Unlike other games, there is no one path to accomplish a goal. You truly make history thanks to something new called Adaptive Mission Mechanic (AMM). In past games you’ve been told to tail, eavesdrop, pickpocket or assassinate someone. This time around your mission could simply be to learn something from someone. How you accomplish this is up to you. If you start to follow him and get spotted, you wont desynchronize and respawn at the last checkpoint. Instead the mission just changes. If you can’t tail him and you lose him, find him again. If a battle breaks out and he dies, pick pocket him to see where he was going or where he came from. Whatever happens, the choice is yours and progresses like real life. Now don’t think you can take the easy way out of every mission and simply kill your target every time and just loot his dead corpse. If you continually take that easy path, people will start to wonder why officials are disappearing and patrols could be doubled for future missions. The city will literally adapt to the choices you make; and every action will have repercussions. Then again, remember this is war. So sometimes a public execution will send a loud and clear message to the Templars. If the Templars want to make a public execution, then so will this Assassin. Since this city is alive, there has to be a heart of it; and the Taverns fulfill that role. More than just a place to grab a drink or play a game, taverns are the social hub of the games that not only contain different shops; but also allow you to join in on the newest feature of this game – Co-Op Missions. It not yet known if old fashion multiplayer games will remain in the game, but Co-Op looks so amazing that you might not even miss it. By joining with friends and others around the world, you can band together and tackle threats and missions you otherwise couldn’t handle on your own. From saving friends from detection to fighting side by side in an all out attack, these Co-Op missions will become the pinnacle of teamwork and multiplayer experience. The fact that these missions contribute to your single player missions and items makes it even more spectacular. As we’ve learned from Assassins Creed IV: Black Flag and the Assassins Creed II Trilogy, there’s nothing like a charismatic and charmingly badass assassin. Thankfully Assassins Creed: Unity continues this trend with Arno Dorian; but rather than being motivated by revenge or selfish desires, he seeks redemption. There is a moment of great tragedy in Arno’s life that he feels responsible for; and rather than want vengeance, he seeks to make sure a tragedy like that never happens again. He is burdened by this loss and feels he failed to prevent it. It is this internal turmoil and regret that makes him seek out the Assassins Order so that he may learn how to fight the evil and corruption that plagues his city. As the story progresses, we’ll get more and more layers to Arno’s character and story; but that’s not all. Whether you prefer to excel in Stealth, Combat or Navigation, you get to decide how your character learns and evolves based on how you spend your Skill Points. As I mentioned earlier, there’s various skills like Highground and Eagle Pulse that can be improved upon. Lockpicking is also a handy skill that can be picked up and can come in quite handy when raiding a large palace with many back corridors. So whether you like stealthy approaches or menacing powerhouse who thirsts for a good fight, you can make that character. The type of gear you carry is also customizable; and all of this transfers seamlessly from Single-Player to Co-Op and vice-versa. With all this talk about the French Revolution and Arno, it’s easy to forget that Assassins Creed is all about how the modern day war between the Assassins and Templars must return to the past to discover their future. So will there be a present day story to this game? Of course. Ubisoft is declining to talk about the present day aspect of their game this early, but Creative Cirector Alex Amancio promises: “It’s very different than anything you’ve seen in any of the past games. Black Flag was different. This is more different.” What this mean, I guess we’ll just have to wait and see; but from everything we’ve seen thus far, I’m sure it’ll be awesome. In fact, if Ubisoft revealed that all these games were actually training us bit by bit to become members of the real Assassin Order, I say that makes a lot of sense – and eagerly await my hoodie and acceptance letter in the mail. Unite and join the Revolution! Assassins Creed: Unity released October 28th, 2014. Until then, stay tuned for more updates, pre-order guides, and check out some more images below. Also, a special thank you to Ubi.Blog and all the Ubisoft commentators who gave us a deeper insight into this stunning new game.